The purpose of this document is to describe a methodology to select the most adequate time-frequency distribution (TFD) kernel for the characterization of impedance cardiography signals (ICG). The predominant ICG beat was extracted from a patient and was synthetized using time-frequency variant Fourier approximations. These synthetized signals were used to optimize several TFD kernels according to a performance maximization. The optimized kernels were tested for noise resistance on a clinical database. The resulting optimized TFD kernels are presented with their performance calculated using newly proposed methods. The procedure explained in this work showcases a new method to select an appropriate kernel for ICG signals and compares the performance of different time-frequency kernels found in the literature for the case of ICG signals. We conclude that, for ICG signals, the performance (P) of the spectrogram with either Hanning or Hamming windows (P¿=¿0.780) and the extended modified beta distribution (P¿=¿0.765) provided similar results, higher than the rest of analyzed kernels. 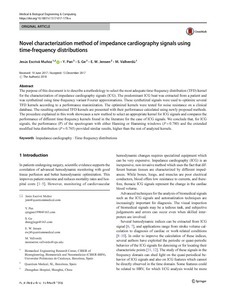 Escrivá, J., Pan, Y., Ge, S., Jensen, E.W., Vallverdu, M. Novel characterization method of impedance cardiography signals using time-frequency distributions. "Medical & biological engineering & computing", Octubre 2018, p. 1757-1770.